Triton's Elite12R-101 is a tilt or drive on / drive off trailer with a straight pole tongue and rear stored aluminum ramp. This is a great way to use your reverse found on most sleds these days. 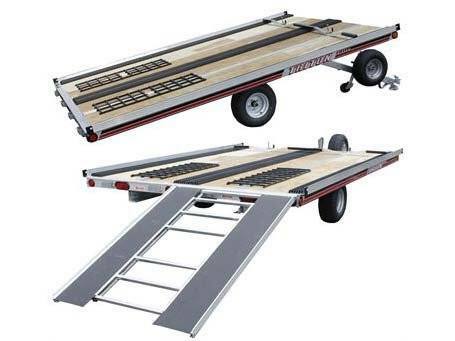 Simply use the aluminum ramp to go on and off the rear of the trailer or ramp on and tilt off the trailer. You have the choice to do what you feel is more comfortable doing with this trailer. The Elite12R-101 includes many fine standard features that have been a staple for Triton Trailers for many years. This 12 foot trailer has standard features including aluminum gull-wing tiedown bars, ramp clamp system for stored aluminum ramp to dampen rattling secured with a padlock, fully treated 5/8 inch plywood, custom aluminum extrusion frame, torsion axles and more! The Elite Series has the most value of any trailer line on the market today.